Come spend some time on our farm! 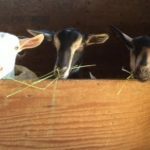 We are a certified organic farm producing a wide variety of artisan farmstead cow and goat milk cheeses, fluid non-homogenized milk, butter and yogurt from our farm’s own grass-fed cows and goats. Visit our farm shop to sample our prize-winning cheeses and shop for quality local products and gift items. Watch the cheese making process through our viewing windows and take time for a stroll around the farm to visit the animals and maybe meet a real farmer! Winner of the 2016 Agriculture & Agri-Food Innovation Excellence Award. Open 10am to 5pm 7 days a week year round. Closed Christmas Day, Boxing Day and the first 2 weeks of January.